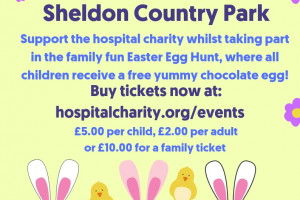 Support the hospital charity's Children and Young People appeal whilst taking part in family fun activities. Come and join us at Sheldon Country Park between 11am - 3pm where you and your family can take part in our Easter egg trail hunt. Remember to have your orienteering skills on hand, as you will be given the task of finding hidden bunnies and eggs all around the park as well as having a chance to meet some friendly farm animals at the Old Rectory Farm in Sheldon Country Park. 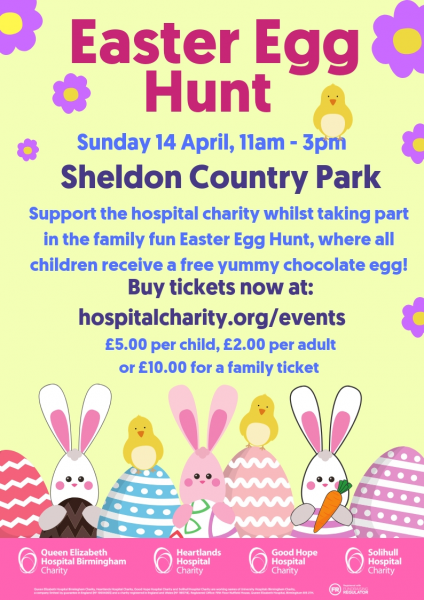 Once you have participated in our Easter Egg Hunt, filled in our activity sheet and returned it to the hospital charity tent, each child will receive a free Easter Egg of their choice! If your children are drawing enthusiasts, we do advise that you to bring your best crayons and felt tips so they can participate in our drawing competition, where they will be in with the chance of winning a very special prize! After the hunt, feel free to participate in any of the additional activities and rides that will be around the park. Remember to also enjoy a trip around the farm where you can visit pigs, goats, ponies, ducks, chickens and cows! Please note that prices will vary when participating in the any of our additional activities such as face painting and fun fair rides. These will be available on a first come, first served basis. Parking on Ragley Drive is strictly prohibited on the day and is only available for residents. We do recommend either taking public transport to the event, or car-sharing with family and friends to reduce parking issues.